A gift basket filled with a random assortment of prizes in the range of $300 will be awarded to the team or individual for the application that best represents a focused application for sharing and interpreting experiences to teach, explain, and/or entertain. Assortment of prizes: Laughing Skull Lounge, 8 tickets, $160 value; High Museum of Art, 4 tickets, $78 value; Fox Theater, 4 gift basket: tshirt ($15), mug ($8), luggage tag ($5), $112 value; Mi Cocina, 2 gift cards, $60 value; Café Intermezzo, 3 gift cards, $75 value; Skate AS, 6 bundles: 2 skate tickets and 2 $5 gift cards, $216 value; Bodies Exhibit, 2 gift cards, $48 value; MODA, 6 tickets, $60 value; Bantam & Biddy, 1 gift card, $25 value; Chick-A-Biddy, 1 gift card, $25 value; Fast Co. Magazine, 10 single magazines, $5.99 value; Fast Co. Magazine, 1 year subscription, $12.99 value; Midtown ATL, 4 Instagram Books, $80 value; IPaT knap sacks, 4 winners, $80 value. A gift basket filled with a random assortment of prizes in the range of $300 will be awarded to the team or individual for the application that best represents a purposeful use of an application for achieving a practical outcome with an individual, a community, or an organization. Assortment of prizes: Laughing Skull Lounge, 8 tickets, $160 value; High Museum of Art, 4 tickets, $78 value; Fox Theater, 4 gift basket: tshirt ($15), mug ($8), luggage tag ($5), $112 value; Mi Cocina, 2 gift cards, $60 value; Café Intermezzo, 3 gift cards, $75 value; Skate AS, 6 bundles: 2 skate tickets and 2 $5 gift cards, $216 value; Bodies Exhibit, 2 gift cards, $48 value; MODA, 6 tickets, $60 value; Bantam & Biddy, 1 gift card, $25 value; Chick-A-Biddy, 1 gift card, $25 value; Fast Co. Magazine, 10 single magazines, $5.99 value; Fast Co. Magazine, 1 year subscription, $12.99 value; Midtown ATL, 4 Instagram Books, $80 value; IPaT knap sacks, 4 winners, $80 value. A gift basket filled with a random assortment of prizes in the range of $300 will be awarded to the team or individual for the application that best represents a novel / creative use of technology to achieve Community and / or Commercial engagement. Assortment of prizes: Laughing Skull Lounge, 8 tickets, $160 value; High Museum of Art, 4 tickets, $78 value; Fox Theater, 4 gift basket: tshirt ($15), mug ($8), luggage tag ($5), $112 value; Mi Cocina, 2 gift cards, $60 value; Café Intermezzo, 3 gift cards, $75 value; Skate AS, 6 bundles: 2 skate tickets and 2 $5 gift cards, $216 value; Bodies Exhibit, 2 gift cards, $48 value; MODA, 6 tickets, $60 value; Bantam & Biddy, 1 gift card, $25 value; Chick-A-Biddy, 1 gift card, $25 value; Fast Co. Magazine, 10 single magazines, $5.99 value; Fast Co. Magazine, 1 year subscription, $12.99 value; Midtown ATL, 4 Instagram Books, $80 value; IPaT knap sacks, 4 winners, $80 value. A gift basket filled with a random assortment of prizes totally +/- $100 will be awarded to the team or individual for the application chosen by the attendees. Assortment of prizes: Laughing Skull Lounge, 8 tickets, $160 value; High Museum of Art, 4 tickets, $78 value; Fox Theater, 4 gift basket: tshirt ($15), mug ($8), luggage tag ($5), $112 value; Mi Cocina, 2 gift cards, $60 value; Café Intermezzo, 3 gift cards, $75 value; Skate AS, 6 bundles: 2 skate tickets and 2 $5 gift cards, $216 value; Bodies Exhibit, 2 gift cards, $48 value; MODA, 6 tickets, $60 value; Bantam & Biddy, 1 gift card, $25 value; Chick-A-Biddy, 1 gift card, $25 value; Fast Co. Magazine, 10 single magazines, $5.99 value; Fast Co. Magazine, 1 year subscription, $12.99 value; Midtown ATL, 4 Instagram Books, $80 value; IPaT knap sacks, 4 winners, $80 value. Help Midtown Alliance and IPaT make Midtown Atlanta a center of technology innovation! Pitch your ideas – or join a team – we are looking for great ideas for mobile applications that tell a story and engage with a community to the benefit of Midtown. Web development and design experience is welcome, but not necessary. Community Engagement: focused applications for sharing and interpreting experiences to teach, explain, and/or entertain. Commercial Engagement: purposeful use of an application for achieving a practical outcome with an individual, a community, or an organization. Join the fun, whether you focus on low tech or high tech. IPaT will be open for ‘office hours’ on Saturday (noon – 8:00 PM) and Sunday (noon – 6:00 PM). Come by to work with your team or reach out for tech support on a variety of tools and technologies (including available databases / digital assets, augmented reality tools, iBeacon technologies, Google Glass). Final presentations will take place on Sunday, February 9th, starting at 6:00 PM, also at IPaT. Midtown Alliance and IPaT will award prizes for the top apps and will work with teams to help further their app development. 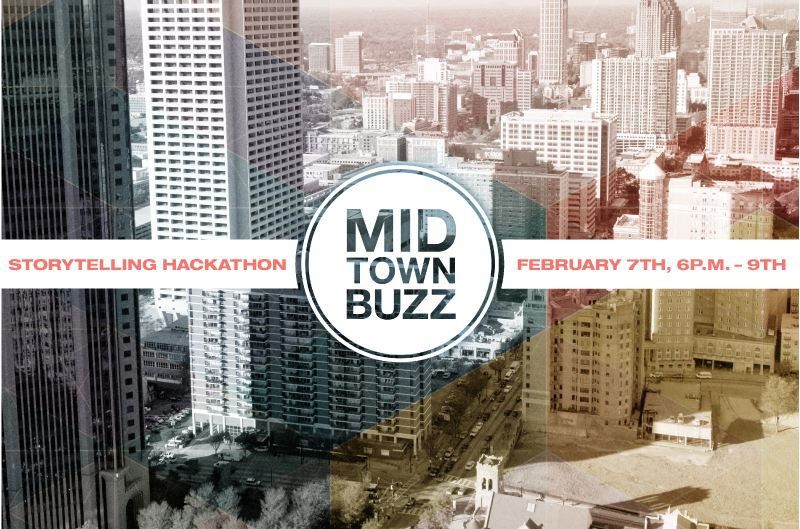 Midtown Buzz is an experiment in mobile innovation focused on engaging urban communities. It includes mobile platform and app development, open-source data curation, contextually aware environments, social navigation (via authentic tastemaker personas to 'feel like a local'), developer workshops, hackathons, trials, needs assessments and the creation of a Live-Work-Play "Laboratory" for exploring the potential of media technologies in creating a climate for continual innovation. All participants must be registered for the event and adhere to hackathon rules to be eligible to enter. Make sure you’re registered for the challenge first. How to enter a submission? LOG IN to your ChallengePost account. When you’re ready to enter your submission, go to the challenge homepage and click ENTER A SUBMISSION. You can also start this process and save a draft of your submission as you’re working on it. *Note enter your submission and make changes to your submission before the submission period ends. How creative and unique is the solution. How usable is what was created and how well is it designed. How well the application encourages local participation, e.g. through contributions, curation, group identification, reputation building, etc. How well the application provides the user with a ‘feel like a local - insiders view’ of Midtown. How well the application enables or encourages Midtown ‘community building’. How well the application addresses specific needs of the Midtown community members – either individually or collectively.